A brilliant idea for a show, a panel show but mostly the background to the show. 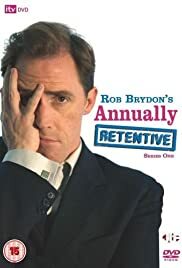 Rob Brydon does an amazing performance, in my opinion the best performance he's ever done in TV. He's absolutely hilarious throughout, he plays himself, a man who believes he's bigger than the show but obviously he's nothing that he thinks he is. He believes he's a big time presenter but he's still just scraping the barrel. This show is absolutely hilarious, every episode Rob Brydon does impressions of other British TV personalities and they're extremely funny, slip your side funny. Its a show everyone should see, if you like Alan Partridge you'll love this show, Rob Brydon is a horrible person, he complains non stop, moans about every little thing, and is completely superficial. You must see this show, you'll laugh no matter who you are!! See it!